This is part 2 in our Proposal Writing Course. Yesterday, we looked at why you need to make the Table of Contents that central hub from which all information flow. Today, we’ll go a step further and examine the Executive Summary. 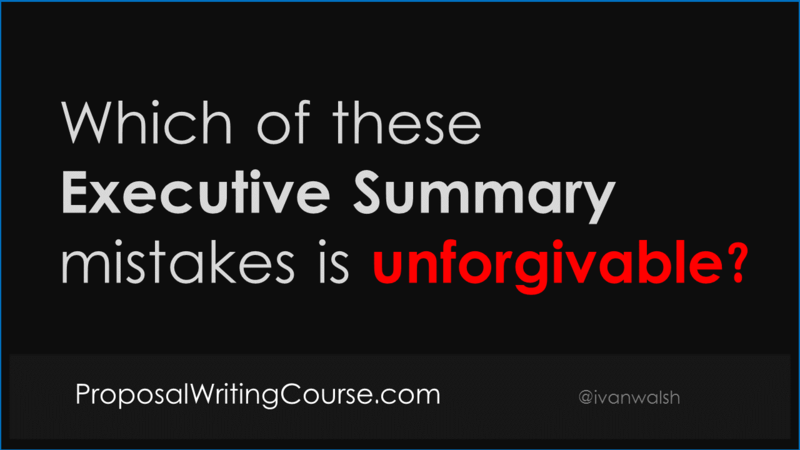 Most Proposal Writers are intimidated by the Executive Summary. There’s something daunting about writing this chapter. Tip – should it be ‘are’ unforgivable, right? …and it should be. The Executive Summary and the Finances are the two most critical sections in your proposal. For this reason, I’ll talk about these more than others and show you how to refine these sections and overcome the pitfalls associated with them. Let’s start. What goes into the Executive Summary? Use the Executive Summary to place the proposal in context. This section should be one or two pages max. Don’t over-whelm the reader with background material. They can find more details about your organization on your website and in press releases. So, what goes into this section? In this example, we’re looking at submitting a bid for a government contract, say to do with Waste Management. To frame the bid correctly, look at how you can introduce the key topics as soon as possible. Think of these as pillars upon which the rest of the proposal will be written. Identify the Government bodies involved in this procurement process, for example. The London Region, which encompasses the administrative areas of counties X, Y, Z, adopted a Strategic Management Plan in 2002. The administrative area of this region has a combined population of 500,000 and covers 10000 sq Kilometres. We now wish to review and replace 2002 Strategic Management Plan in compliance with the Waste Management Act 2003 and the Waste Management Regulations, 2005. The new plan shall make reference to the existing Waste Management Plan, existing preparatory work, the recently commissioned Waste Management Study, EPA National Waste Database, EU Waste Management Plans and all other relevant documentation and legislation. Close with reference to legal documents and supporting materials. The pillar concept is worth considering as it gives you a framework to write your proposal around. The most successful proposals are those that develop themes and then use these to press emotional triggers that influence the assessors. If this doesn’t make sense, think of it like this. The team who wrote the RFP have a checklist of things they’re looking for in the bids. For example, costs, ability and experience. But, they are also looking for bidders that feel right, who are on the same wavelength, and who get it. These are emotional factors play a key role in their decision-making process. In the next lesson, we’ll look at how to write the Supervision section. Does RFP Software (Really) Work?